Today is one of those sad days regarding Yahoo. They have begun transitioning to Microsoft for searches. It wasn't like Yahoo was my primary search engine, but in my opinion their search results were much more accurate and relevant than Microsoft's Bing. It is probably to early to tell exactly how this will pan out for them. It is just a big disappointment for me. Maybe somehow they will pool their resources and end up with a better experience. I just won't hold my breath on that. Yahoo! began transitioning certain back-end functions for Yahoo! 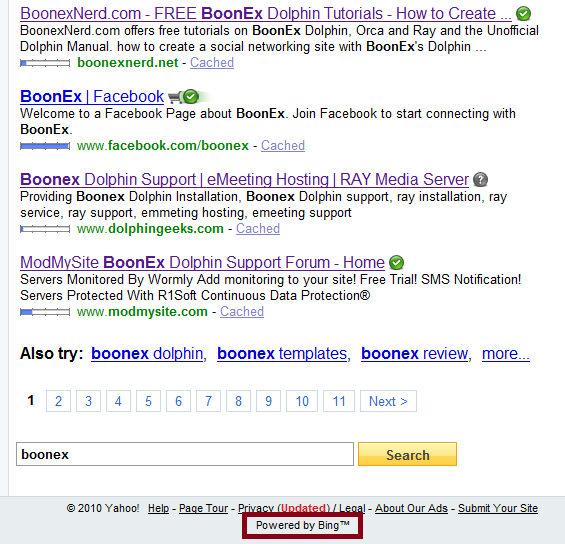 Search over to Microsoft’s search platform. Well, I am proud to announce that the transition of organic search between Yahoo! and Microsoft is complete. Yahoo! Web, Image, and Video search experiences on both desktop and mobile devices are now powered by the Microsoft platform in the US and Canada (English), with more markets to come. The speed in which this was completed is a testament to the great work and partnership between a number of Yahoo! and Microsoft employees, the ranks of which are numerous. I’d like to express my sincere appreciation for each person who contributed to this great accomplishment. We will all just have to wait and see how this works out. I just have a bad feeling about it.